VisitColombo.com is a site operated by Hospitality Solutions ("We");we are a business registered in Sri Lanka. If you have any concerns about material which appears on our site, please contact support@visitcolombo.com. Colombo is by far the most happening city in Sri Lanka! From the busy street hawkers in the noisy bazaars of the Pettah area to the blue collared, tie-clad businessmen that flock the World Trade Centre, Colombo is where the 'rubber meets the road'. It is the where the businessmen shake hands and sign multimillion dollar contracts. It is where the Tea Auctions, which traders from all over the world visit, is held. It is where the east meets the west. In short, Colombo is where the nation's heart beats. For a long time, Colombo was just an uninteresting, unavoidable and sometimes dangerous, transit to the island’s more sought-after tourist destinations elsewhere. 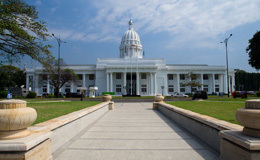 In recent years however, Colombo has refashioned itself as a popular tourist hotspot offering many cultural, historical and nightlife attractions.